As I mentioned before, Representative Boland (and his staff) have worked hard to help find and secure grants for a pretty good number of worthwhile projects. One of our recent accomplishments was securing $100,000 for the Village of Orion. We were able to deliver a $50,000 grant to help with the replacement of Orion's groundwater storage tank, and a $50,000 grant for street resurfacing and repair. Orion's groundwater storage tank was in great need of replacement, and street resurfacing was another priority for the Village Board, so those projects were among our top priorities at Mike's office. Yesterday, Representative Boland travelled to Orion to official announce the approval of our grant requests on Orion's behalf. 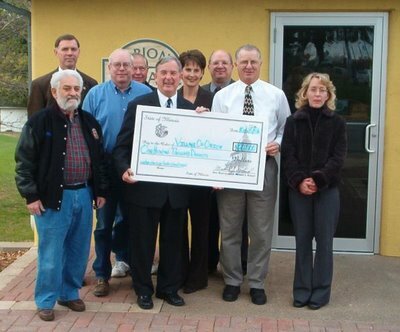 Pictured above is Representative Boland presenting Orion VIllage President James Cooper and a variety of other city staff and officials with an oversized ceremonial check for $100,000.